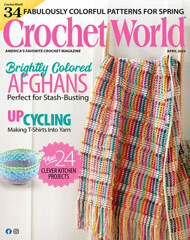 Fun, oversize, cluster-stitch granny squares worked in vibrant hues will add a bold splash of color to any decor. This e-pattern was originally published in Glorious Granny Squares. Size: 44" x 56". Made with medium (worsted) weight yarn and size G/6/4mm hook.